Fishing has been really good lately. Ive been running trips everyday with very little time to post reports. Fishing has been real good inshore. The red and black drum has been on fire. Spanish Mackerel and sharks continue to bite better than ever and the King Mackerel has finally showed up. We had our limit the other day by lunch time. 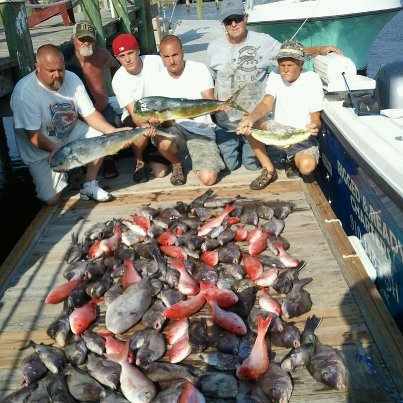 Grouper, Snapper , and Black Sea Bass are biting as fast as you drop your bait to the bottom. If your wanting to go fishing just call me and lets talk. 910-448-FISH (3474). Here is a Pic of some repeat customers from Charlotte, NC.